Prancie and Stinky here- we love our Dad so much that we even share his lap..
Wishing my daddie a very Happy Father's Day and all daddies too!! I know that I'm pretty much a "Momma's Boy" - I'll admit it right here and now.....but when Mom's away for a day or two or maybe out shopping and I'm in need of a HUG, you're always there for me. 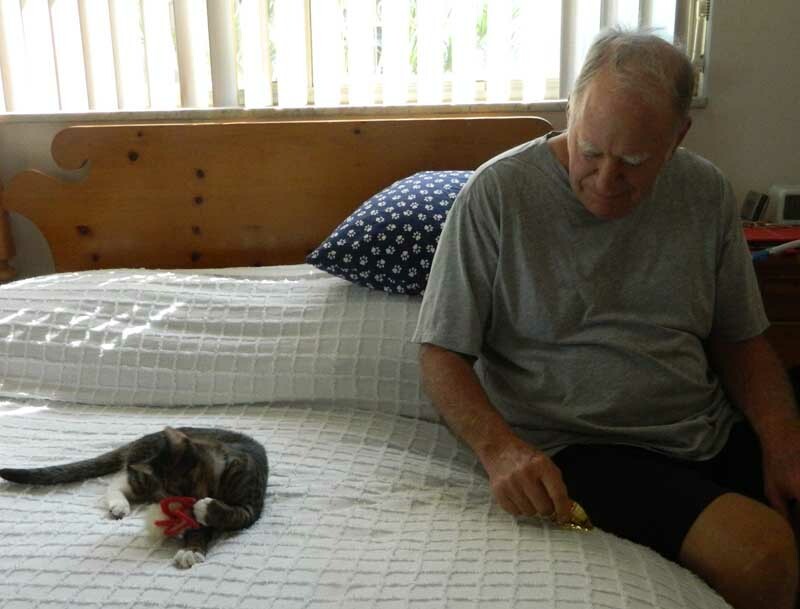 You take me outside when I scream ask politely at the door, you give me a treat when I scream ask politely and sometimes you just pick me up for no reason and carry me around the house and let me look out the windows while you speak softly to me about what we can see out there. You're the BESTEST Dad ever..............and I promise to love you "to the moon and back" ! 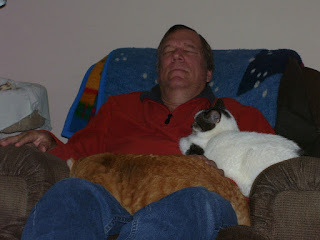 And my MOST favorite.......He never wants to disturb me so he'll pick me up and carry me to a nice snoozy spot if I'm in his chair. 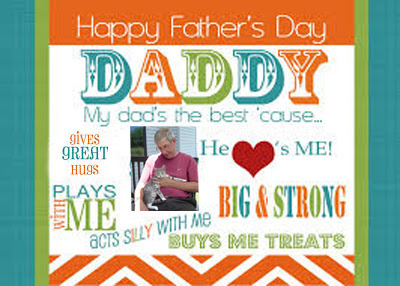 Happy Father's Day Dad.......I love you!!! Ducky inside the empty box. 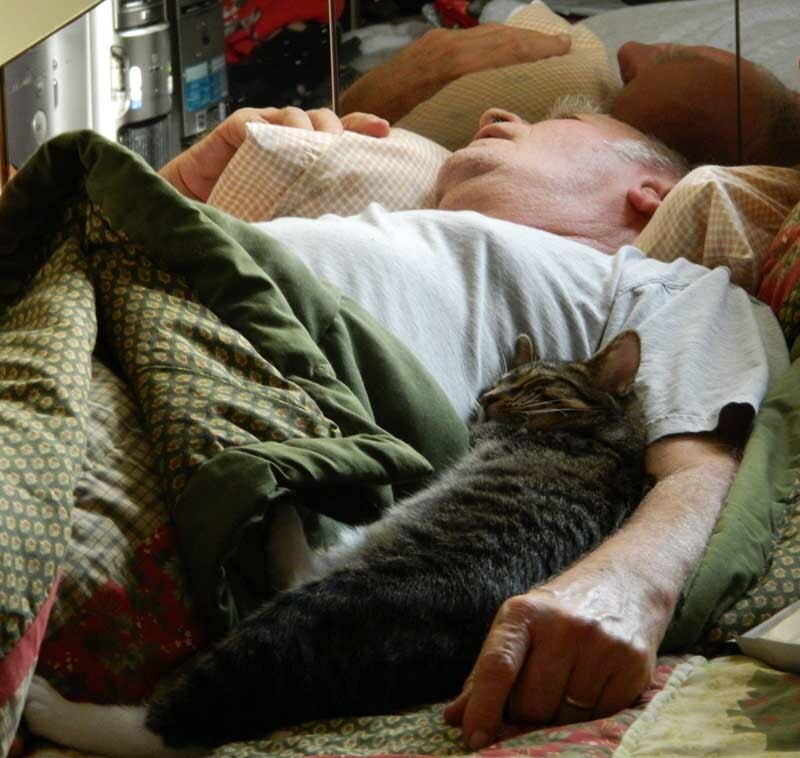 We both got to enjoy it. Hi everyone! 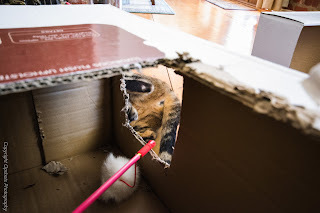 Piewhackits here, and Happy International Box Day! Duchess does not get excited about boxes. (We know, we don’t know what’s wrong with her either. Mumsy even put her in a box. Duchess said, “Woooo” and then jumped out and ran to Mumsy. She even tried putting Duches and a box alone together in a room. Duchess said, “Woooo….. oooooo…. wwwoooooooooooo” till Mumsy came and let her out.) So, I’m here with a post for International Box Day. Duchess is in her comfy, soft, warm bed. Yup. Happy International Box Day! We love boxes! 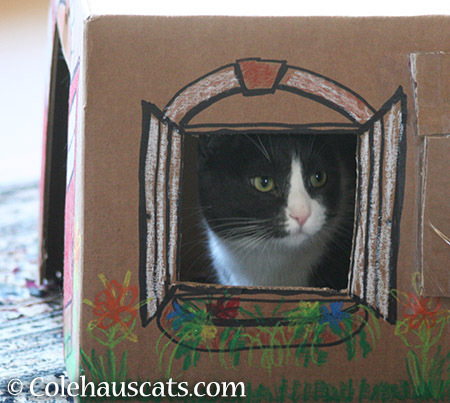 Apparently, so does our mom who couldn't resist making our plain, just-as-good-as-any box into a box house with a door and windows and flowers. Tessa says, "This is a perfect Tessa-sized window. But why do we need flowers on our box, mom? We're cats, not gardeners!" Flower-lovin' painting boy Quint insists flowers are a must for decorating any well appointed box house. "You should have let me paint the flowers though, mom," he says with a sniffle. Some more Colehaus Cats are celebrating International Box Day today over at Colehauscats.com. Come visit if you can! Thanks to Peaches and Paprika and sweet pup Luke of Wag 'N Woof for being today's wonderful hostesses and host. KaTwo is in the odds and ends box and Prancie and Stinky were more interested in putting their scent on the outside of the box. Happy International Box Day Tabbies! 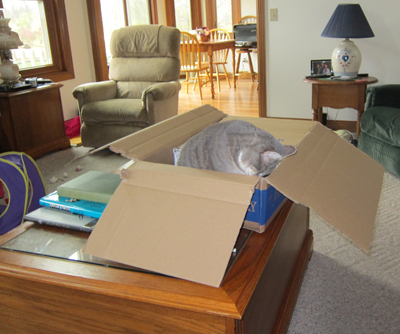 Yep, that's me in the box. Hay y'all itz BOX day!!!! 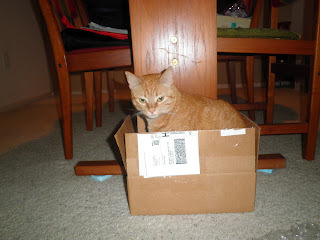 WooHoo Weez lubz boxez at owr howz and yesfurday when weez gawdid hoem frum da VET weez had 3 nu boxez waytin' on us. Mommy sez I'z kant tell ya' what wuz in 'em jiz yet, but itz gunna beez good. 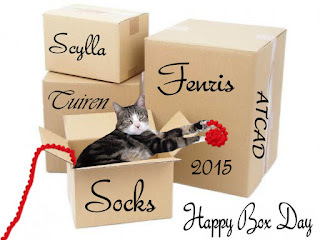 ☺ Aneewayz weez glad too beez sellabraytin' in and on owr boxez. 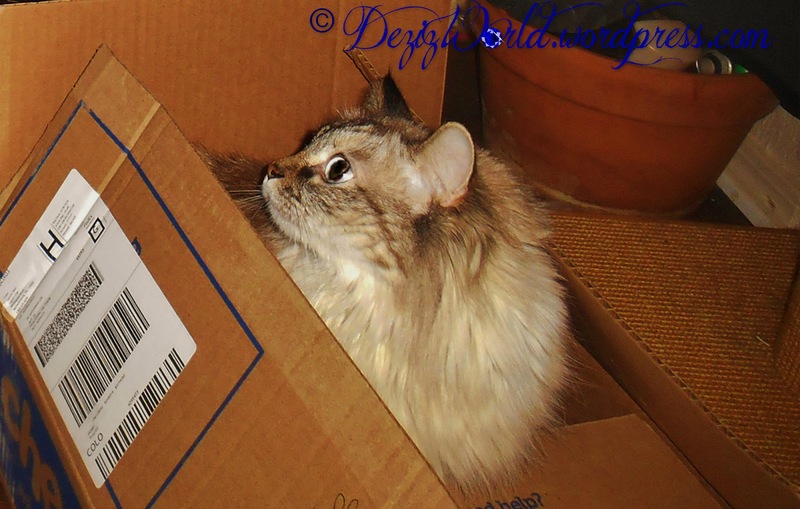 Don't furget to come by our bloggy fur more box fotos and a VET update. Just click here. This is one of my favorite days of the year. 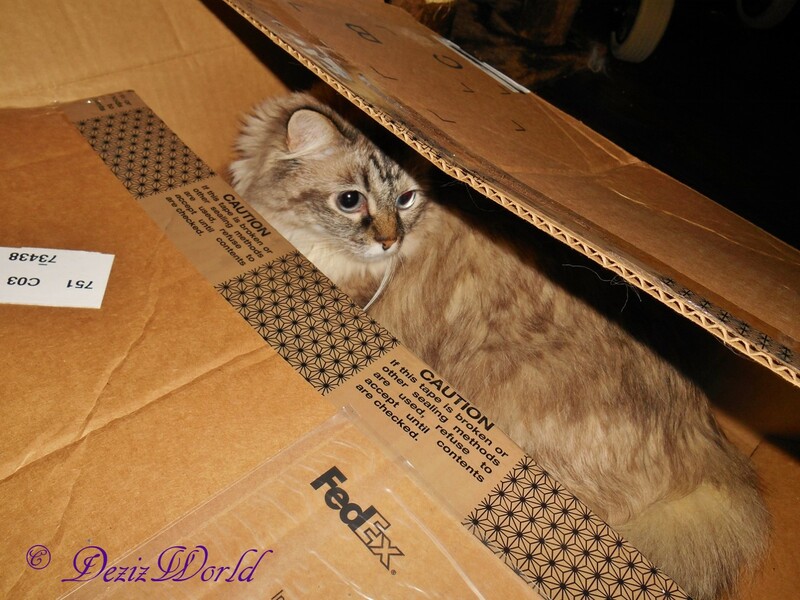 I find boxes a lot of fun!! 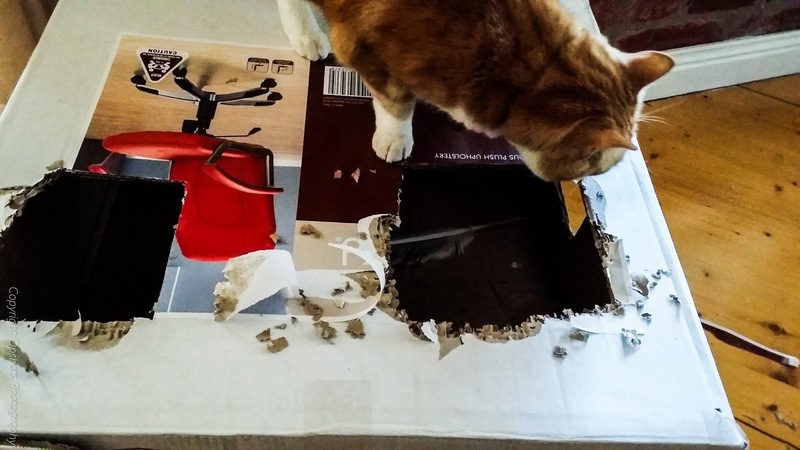 I discovered this box sitting on my coffee table. I am wondering why it is full of stuff and even more wondering why mom cannot figure out what I am trying to tell her. I CANNOT GET IN THE BOX WITH ALL THIS STUFF IN IT!! At last some of the things in the box were removed and I have a little room. Still not happy though. Come on mom! Help me out, please. Phew, I thought mom would never figure out what I wanted. 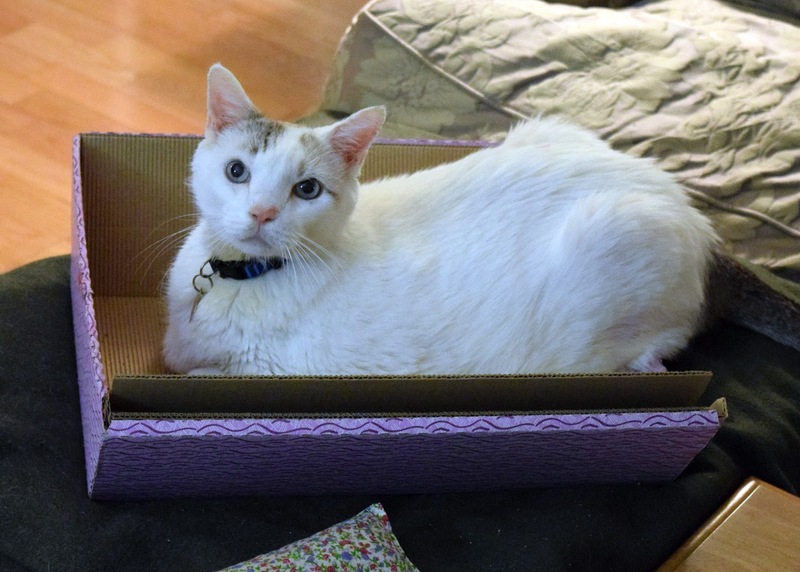 I am worn out now and will snuggle down in my new box and catch some zzzzs. I am happy mom left some soft paper in there for me to use as a mattress. Happy International Box Day Everyone!! There is a participation badge for today event. 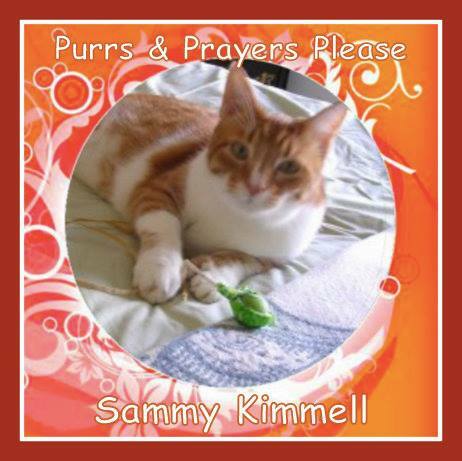 Sammy designed it and you may pick it up by clicking the link on his post here. Thanks Sammy for doing that. The headline is right. This certainly is a little box. 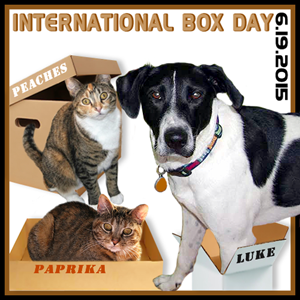 Happy International Box Day everybuddy! I used to sit in boxes all the time but not so much anymore. I associate boxes with the flashy box and that’s not a good thing. 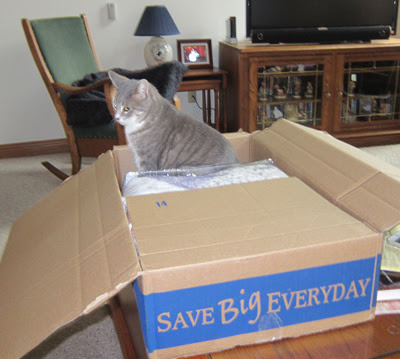 On the other hand, this box is big enough to make a fort. Thanks to the TCC and Sammy for hosting this event. I look forward to seeing everybuddies’ Box Day pics. The above pics have been Photoshopped to death. For some unedited fotos, come visit my International Box Day Foto Frenzy. 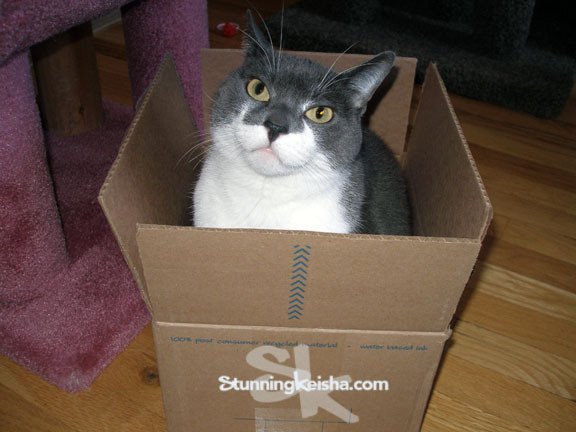 It is International Box Day, and we LOVE our boxes! Brothers are the BEST Box! Happy International Box Day our friends! I love Christmas for many reasons but one BIG reason is that there are so many boxes around on Christmas morning! 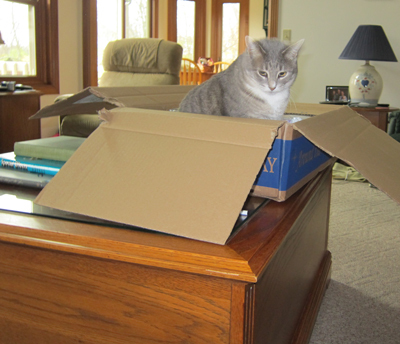 I can barely wait for one to become available when Mom and Dad are opening their presents.....boxes everywhere.....all sizes and shapes.....I try all of them out. Eventually I zero in on the most comfy one and stay "parked" there for most of the day. 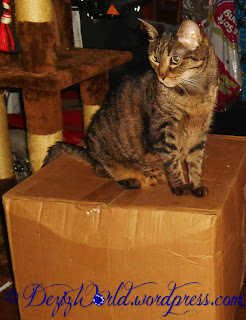 This Christmas this turned out to be my most favorite box.........I put some of my new toys in it and a ribbon or two. I was happy. 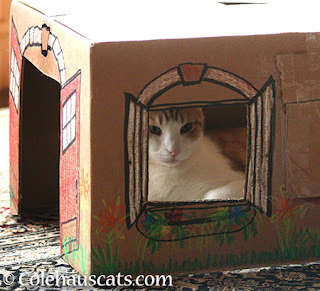 I'll be excited to see all the "box" photos here at the TCC today and around the blogosphere. 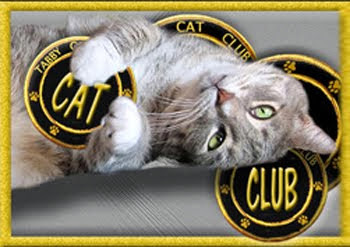 If you have pawticipated in the TCC Box Day event, we have a special goodie for you to show off on your blog! A pawticipation badge and you can CLICK HERE to visit my blog and pick up (copy) the badge for your very own................hope you've had fun today - enjoy your box!! Hehehehehe!! I loved International Box Day! Hi evfurry..Mum has been off the bloggies but we INSISTED that we do our box day post..
Mum is just lucky we do not post her off in one and get a new typist type person MOL.. 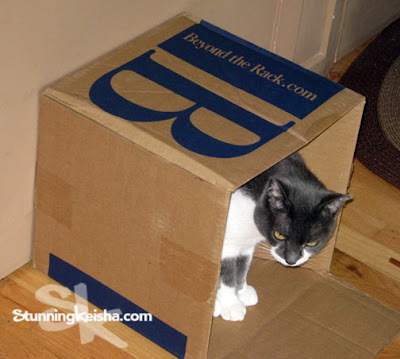 Boxes are a fave in our house..we can hide and jump out and smacky paw each other ..such a thrill not knowing who is on the other side MOL.. 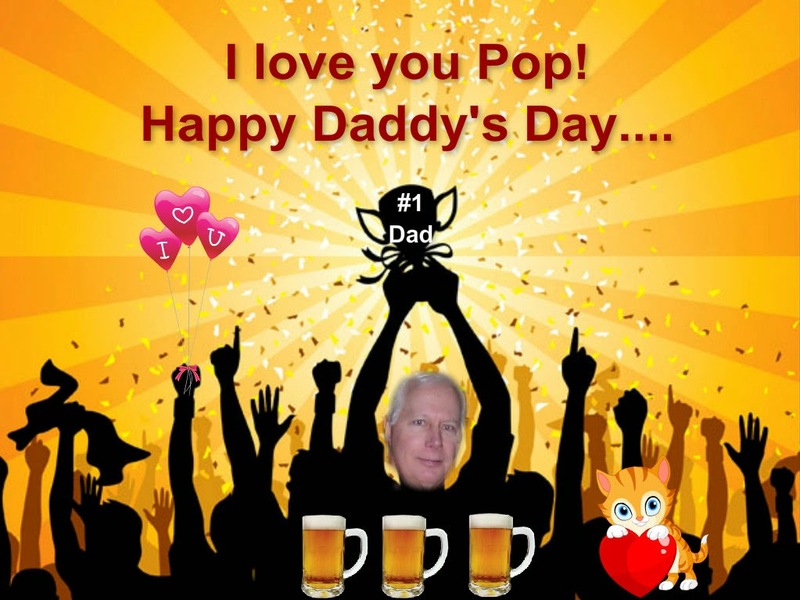 So we are happy to be here to celebrate the great day that honours our boxes..
Of course we thank Gracie and Sammy and Raz for these fab events and also thank Zoolatry for the super graphic! First off it is me and my fave box which has only just been stolen and taken to the recycle..how rude.. So here it is..i miss it already..lucky Mum got a new vacuum cleaner so it has already been replaced! 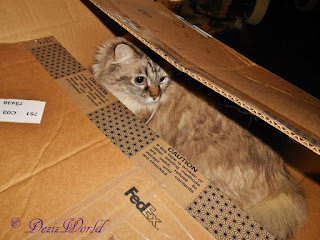 Pickles of course enjoyed MY box too..i suppose being a four kitty house we have to share.. 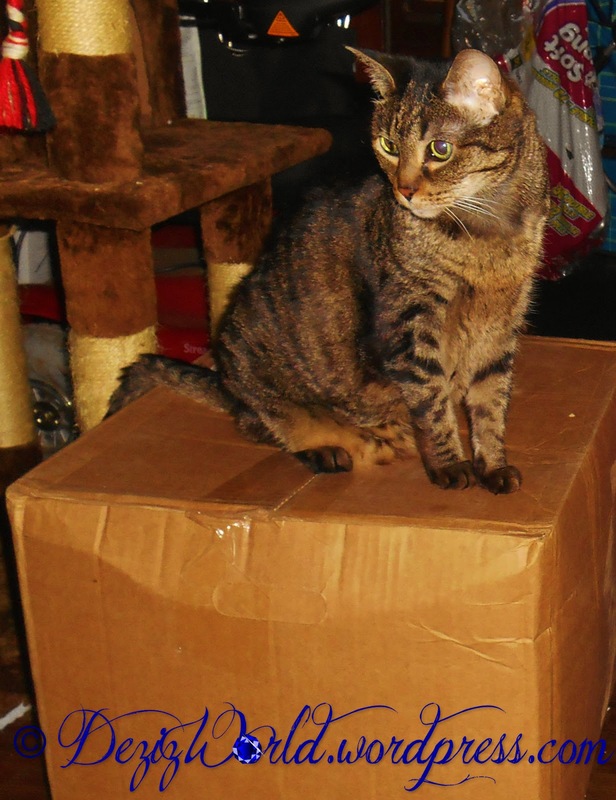 Here is Pickles doing her best kangaroochi kicks on my poor box..no wonder it finally broke MOL..she might be tiny but she packs a punch! 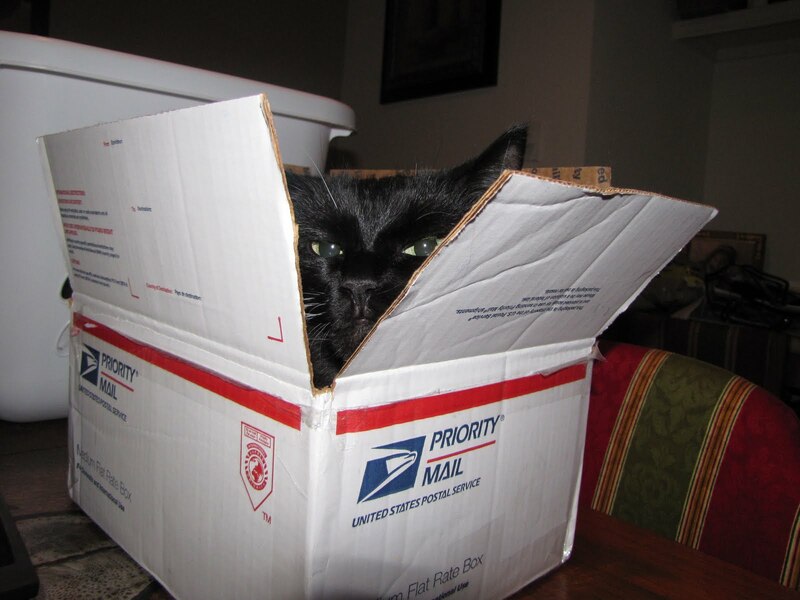 So thanks again TCC for another fun event..and here's to all those poor boxes out there that have to put up with our kitty shenanigans! Boxes! Not Grace, but her boys!! Grace refuses to get into boxes or bags or anything confining. I think she doesn't like to be where she cannot see her sons! Here's Audace, who had been dragging all that packing paper out of that box. It all makes such wonderful sounds! And here's Ruse, thinking he was hiding, I'm sure! 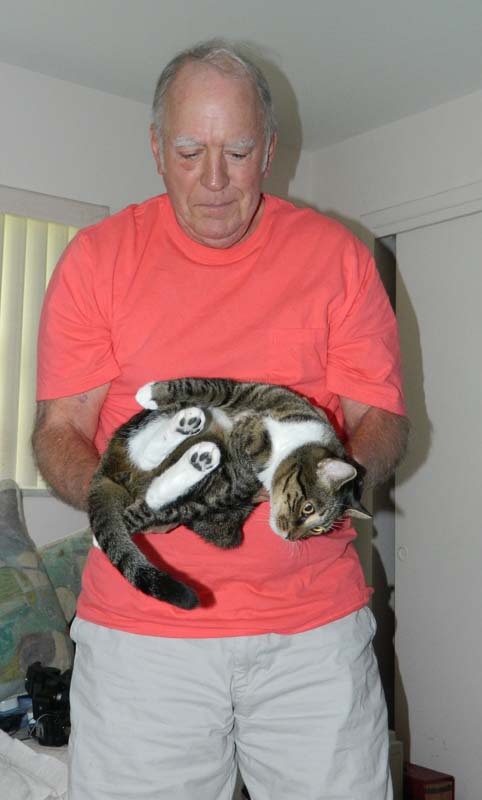 Pawesome Pet Of The Week!